Guiding is a profession that requires a great amount of experience, soft skills and professional training. 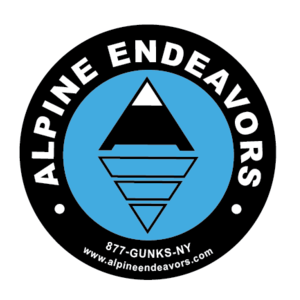 Alpine Endeavors looks to hire guides for all aspects of climbing that have the utmost in professionalism, and climbing & guiding experience. All candidates interested in working with us should have current wilderness medical training (WFA, WFR, etc), CPR, and in-depth experience, and AMGA training and/or certification suitable for the terrain in which they will be operating. They should be able to teach and communicate well, have a good personality, and be able to deal with the stress and situations in guiding with a calm attitude. In addition to having the proper training and certification, all candidates interested in working as a guide in New York are required to be New York State licensed. This requires you to contact the state Department of Environmental Conservation and submit a licensing fee, current photo and guiding resume, show proof of current first aid, CPR and water safety certifications, and take a written test for which field (rock, ice, hiking) you are seeking licensure. More details about the NYS license can be found on the NYSDEC Guide License webpage. Those candidates interested in working with us that do not have AMGA certification will only be able to work as assistants to the certified guides until they gain certification. This process allows candidates to gain the required experience for certification under direct supervision. Those candidates interested in working as interns can do so only as an assistant and must meet the requirements set forth by the NYS DEC (see above). If you are interested in working with us, please send a detailed work resume, climbing/guiding resume, and cover letter. *We are currently fully staffed; - however we do keep resumes on file and request interested parties send one in.